Hepatitis means "inflammation of the liver," and also refers to a group of viral infections that affect the liver. The most common types are hepatitis A, hepatitis B, and hepatitis C. Hepatitis D and hepatitis E are less common in the United States, but are frequently found in other countries. Viral hepatitis is the leading cause of liver cancer and the most common reason for liver transplantation. An estimated 4.4 million Americans are living with chronic hepatitis; most do not know they are infected. 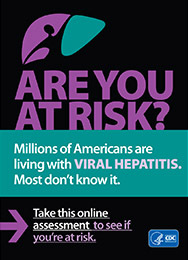 The Centers for Disease Control and Prevention offers an online assessment to determine if you are at risk for viral hepatitis. Medications, called antivirals, can be used to treat many people with chronic Hepatitis C. There are several medications available to treat chronic Hepatitis C, including new treatments that appear to be more effective and have fewer side effects than previous options. For current information on approved treatments for Hepatitis C, please visit the Food and Drug Administration. For more information on testing and treatment locations, visit the Alabama Coalition for Testing, Interventions, and Engagement in HCV Care (ACTIVE-C). Hepatitis A, B, C, D and E are all reportable diseases by the Alabama State Board of Health. This means all healthcare providers and clinical laboratories are required to report "diagnosed" cases and "suspected acute" cases to the State Epidemiology Department using the REPORT Notifiable Disease Card. Public health agencies are leading prevention and awareness efforts to inform and improve the health of people with viral hepatitis or at-risk for viral hepatitis. The Centers for Disease Control and Prevention (CDC) has unveiled the national hepatitis C education campaign, "Know More Hepatitis," which offers an online assessment to gauge your risk of transmission and offers numerous publications to educate you about viral hepatitis.